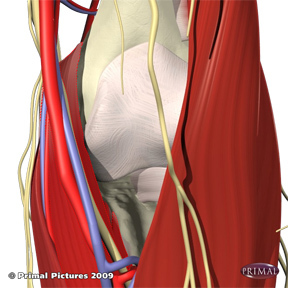 Pronator Syndrome: This syndrome is cause by frictional irritation of the median nerve as it passes between the two heads of the pronator teres muscle. 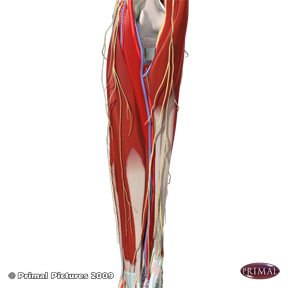 A patient suffering from pronator syndrome may present with a diffuse forearm ache that is usually the result of prolonged muscular effort. Symptoms of paresthesia are uncommon however can be noted in the median nerve distribution of the hand which may be exacerbated by forced pronation. Tenderness over the entrapment site maybe present and can lead to pain in the proximal forearm that is increased with pronation. Of note, when present, paresthesia will include the palmar branch of the median nerve which supplies innervation to the skin over the carpal tunnel and proximal palmar region. This is significant because this branch comes off of the median nerve prior to entering the carpal tunnel and thus will remain unaffected by true carpal tunnel syndrome. 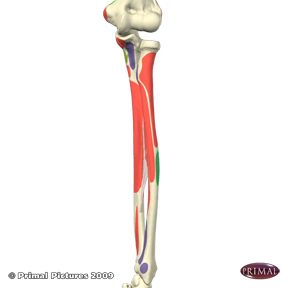 Intersection Syndrome with the Brachioradialis: a common condition which has to date never been discussed in the literature is frictional irritation occuring between the insertion of the PT and the Brachioradialis. Patient will complain simply of pain in this region (see picture below) which is exacerbated with forearm use and/or with gripping actions. I have seen this condition most often in serious weight trainers/lifters. Palpatory findings will reveal friction and fibrosis between the muscles with a reduction of independent motion between them.